Annually I run a thread sample exchange amongst the tatting lists. This blogs shows the threads that I have received through this exchange and the patterns I have tatted with this thread. My goodness, 3 posts in less than a month. That must be a record for me. I had another request. This time to see my shawl in progress, as you can tell by the turned over edges and the hanging threads. I was thinking it was small enough to scan, but apparently I've made more progress than that. It is sitting on the cushion of my couch. I figure that 20 motifs to a side is my finished goal. Figuring on a good day it takes me 30 minutes to make a petal, and there are 6 petals to a motif... I don't want to do the math and find out, I may stop . The main time that I work on it is during my lunch break walk, much to the amazement of my coworkers. They wonder how I can walk, tat, and listen to my MP3 all at the same time. I sometimes have to stop walking to make a join. And before you get concerned, my walking course is the inside upper balcony of where I work. I wouldn't think of doing this outside on the sidewalk. This is also the piece I grab when I have to wait anywhere (you know the drill) or when I'm doing demonstrations or listening to a concert in the park. 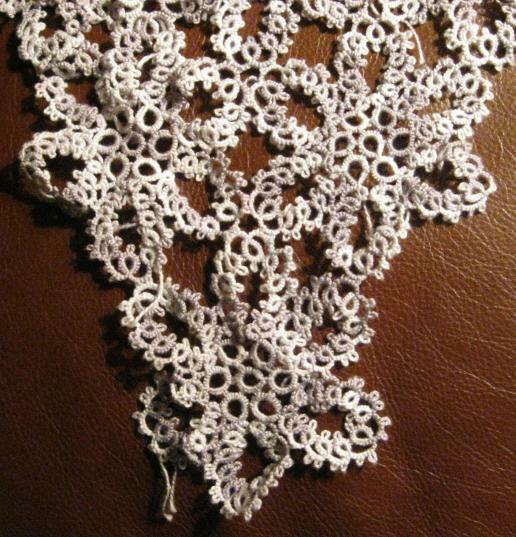 The base motif is from Jan Stawasz's tatting book. I see by his webpage that is currently out of print. He used it to make a vest and hat, but I have more of a need for a shawl than a vest, so that is what I am making. The thread that I am using is Valdani Pearl Cotton, color JP 10 and I get it from DS9Designs. While the colors of the Valdani thread are just wonderful, it is far from my favorite thread to tat with. It is extremely soft and sometimes isn't very uniform. I had to stop, cut, and add a thread last week because I encountered a poorly done splice that I just couldn't tat through. As a shawl, though, the thread is just perfect. This is going to be absolutely stunning! One of a kind, too! I used to be suggested this web site via my cousin. I’m no longer sure whether this put up is written by means of him as nobody else recognise such specified about my difficulty. You are wonderful! Thank you!